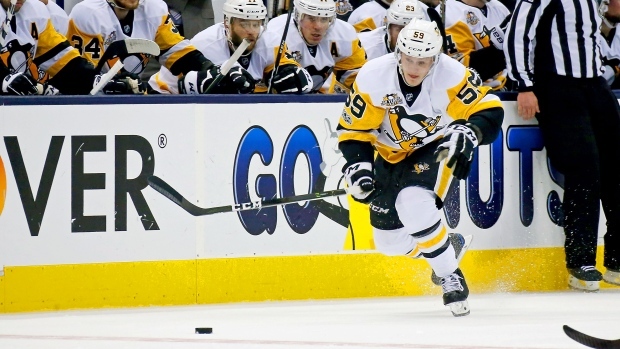 Count Pittsburgh Penguins forward Jake Guentzel among the large group of restricted free agents who figure to cash in on their second NHL contracts in 2019. According to The Athletic, Guentzel's agent Ben Hankinson, was ready to negotiate an extension for the 24-year-old last summer, but Penguins general manager Jim Rutherford told him he preferred to hold off until after the season. Guentzel, who has 23 goals and 42 points in 37 career playoff games, is on pace for a career-high 38 goals and 69 points this season. He insists the looming contract negotiation is not a distraction, but did admit he's aware of what's on the line. A contract comparable for Guentzel could be Toronto Maple Leafs forward William Nylander, who signed a six-year deal worth $6.96 million per season last Saturday. Guentzel is averaging .70 points per game in his NHL career, while Nylander has a .73 average. Guentzel, who has12 goals and 22 points in 26 games this season, is also on pace to top Nylander's totals from last season. The 2013 third-round pick said more restricted free agents may follow Nylander's path moving forward. Since he signed his entry-level contract at 21, Guentzel will be arbitration eligible next summer. Hankinson told The Athletic he is willing to open negotiations on Guentzel’s next contract at any time.